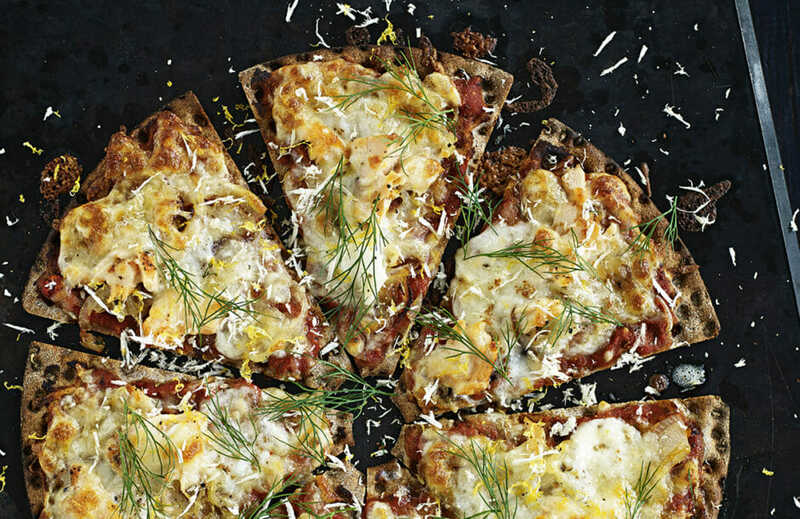 Hej hej, another quick and easy crispbread pizza recipe. This time flavoured with two Scandi staples - salmon and dill. Dillicious. By using a round of Leksands as your base you can have pizza in 12 minutes - and the mild rye flavour works really well with the salmon. An added bonus is, of course, that it is actually good for you. Win win win. Win. Finely chop onion and fry in a bit of butter until soft - add a pinch of sugar and the garlic and let caramelise. Season with salt & pepper. Spread the tomato sauce over the base. Add the onion and the salmon in smaller chunks - finish with the mozzarella and grated cheese. Season with pepper. Bake for approximately 10 minutes until the cheese is bubbly and slightly golden. Top with lemon zest, grated horseradish and a drizzle of browned butter, if liked.